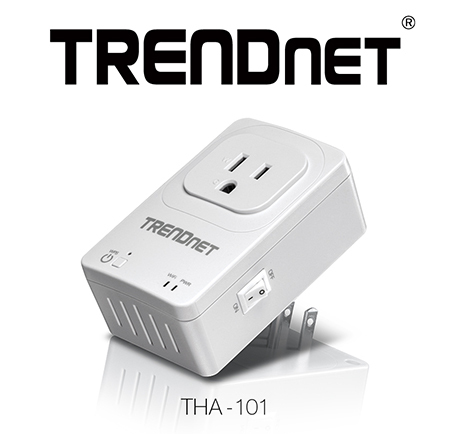 TORRANCE, Calif. – December 4, 2014 -TRENDnet, a best-in-class wired and wireless networking hardware brand, today announces the availability of the Home Smart Switch with Wireless Extender, model THA-101-a combination smart electrical outlet and powerful N300 wireless extender. Place the THA-101 in a location where there is still two bars of home wireless signal strength from an existing wireless network, displayed on a mobile device. Plug in the THA-101 and follow a quick app-based installation. The powerful built-in N300 wireless extender then broadcasts a strong wireless signal to an area of your home with low or no wireless coverage. Plug in a light, fan, or appliance into the electrical outlet on the front of the THA-101 and use the free Apple® or AndroidT mobile app to turn the outlet on/off from a mobile device with an Internet connection. Users can also use the app to create a weekly on/off schedule, with varying daily on/off times, so that lights are on when returning home or to give the illusion of being home. Overcurrent protection trips a circuit relay, cutting power to the built-in outlet, when current exceeds 16 Amps. The free app displays detailed real-time electrical consumption including the current (in mA), voltage, power (in Watts), and total energy consumption (in kWh).